Got a Bachelor’s Degree? … Odds are you’re a woman. Way back in 1975, more than 1 in 4 guys had a degree; less then 1 in 5 gals did. 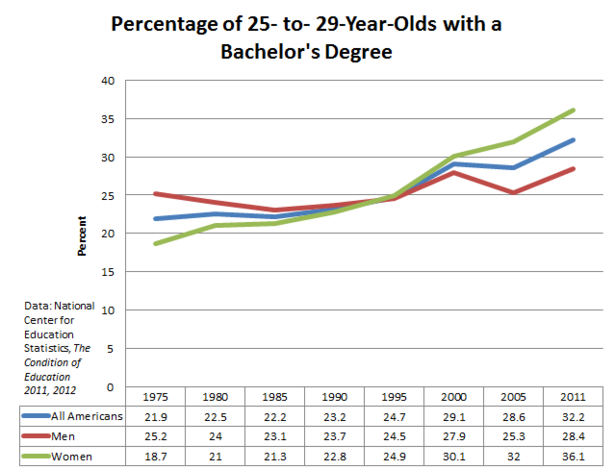 Curves crossed in 1995 when the percentage of young women with degrees hit 1 in 4 and the guys’ rate slipped back a bit. Since then, women have been opening a lead … approaching the 40% mark. Tags: Education, gender gap, What percentage of women have college degrees? This entry was posted on June 12, 2012 at 6:04 am and is filed under Demograhics, Education - Academics. You can follow any responses to this entry through the RSS 2.0 feed. You can leave a response, or trackback from your own site. I would be interested in the breakdown of majors by gender, as well… and with this trend over time. Specifically, how do the degrees earned match with the job market? Is either gender shifting its degree selection toward engineering or liberal arts? Is this available on the web somewhere?